Learn the causes why your #Apple iPhone 6 Plus (#iPhone6Plus) get stuck on the recovery mode. Know a couple of steps you can use to get your iPhone out of the recovery mode to make it work again. What you should do after you have successfully rebooted your phone out of the recovery mode to prevent it from entering the same state. Lastly, learn what you should do if your iPhone 6 Plus remains in the recovery mode despite everything you’ve done. Putting your iOS device in recovery mode is a recommended procedure for those who are having trouble performing updates or system restore. Originally, it’s supposed to be a quick and simple process. But there are some cases where things go wrong and then a supposed to be simple restore or update now becomes a bigger problem. 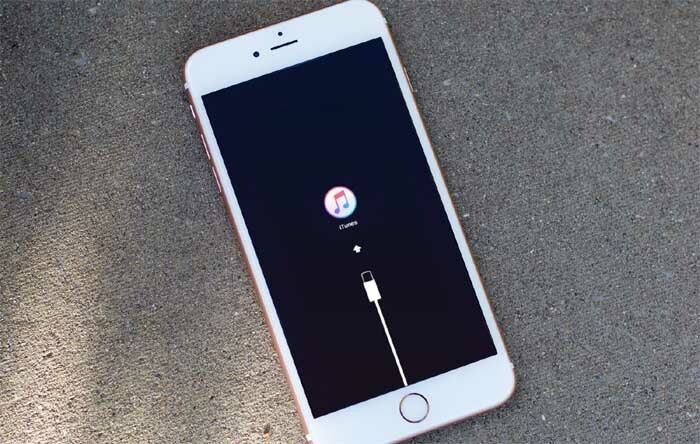 For instance, many iPhone owners who attempted to update or restore Apple devices like the iPhone 6 plus have ended up with their phone being stuck on recovery mode. What should you do then if your iPhone is also stuck on this mode? Read on to learn how to fix this problem and save your iPhone. What causes your iPhone to get stuck on recovery mode? In most cases, an iPhone that gets stuck on recovery mode denotes something went wrong with the update or restore process. It might have been interrupted due to insufficient power charge. It could also be an indication or a minor or major software problem. Your iPhone can be stuck in this mode if some files become corrupted while performing an update or system restore via iTunes. It can also happen when iTunes is unable to recognize your device so it keeps searching for your iPhone and remained in that state. There are also other cases of iPhone being stuck on recovery mode due a network problem. For example, the Apple server is congested (overloaded), which results to a delay in both updates and restore through iTunes. Meanwhile, some users won’t be able to use or exit recovery mode because of hardware issues like broken, stuck buttons or other damage to the hardware components. In this case, a technician’s aid would be necessary. In addition, jailbreaking can also cause your iPhone to get stuck on recovery mode. Unfortunately, Apple does not offer support in such cases. How to get your iPhone 6 Plus out of recovery mode? Step 1. Try to use recovery mode fix tools like Reiboot. Considering the reason your iPhone 6 Plus stuck in recovery mode is not due to a faulty hardware component, you can get it out of this mode using a free piece of software called Reiboot. It’s a program designed to force iPhones into and out of recovery mode. To use this tool, you need to download the program and install a compatible version to your computer (Mac or Windows). After you install the program, open it and then connect your iPhone 6 Plus to the computer. Wait for the computer to detect and recognize your phone. You should see the Exit Recovery Mode button becomes enabled when the connection is successfully built. Just follow the onscreen prompts to exit recovery mode. Once your iPhone is out of recovery mode, it will reboot. Step 2. Try using another computer, if available. Operating systems on the computer as well as iTunes version would also matter. This is why using the latest version for both iTunes and computer OS is highly recommended. So if you’re iPhone is stuck on recovery mode while using a Mac computer, you can try a Windows PC instead (or vice versa) and see what happens. If you’re using a MacBook, I strongly suggest try switching to a Windows computer. Also ensure the iTunes version installed on the computer is the latest version. In case you see an error message containing error code while attempting to restore via recovery mode, take note of the error code or message. You can use this code or message to troubleshoot and fix the problem permanently. Once you have successfully got your iPhone out of recovery mode, open iTunes and back up your device right away. If iTunes does not recognize or detect your device, then you may proceed with DFU restore instead. Many users have considered DFU or Default Firmware Update a better option for iPhone system updates and restore. It stands a better chance of offering a permanent fix for system restore or update problems with iOS devices compared to the standard iTunes and recovery mode restore. If possible, be sure to back up your iPhone to iCloud or iTunes before you begin the DFU restore. During the process, your computer erases and reloads every bit of code that controls software and hardware components of your iPhone. A DFU restore is not recommended if your iPhone is water-damaged because there’s a chance that your iPhone can become completely dysfunctional if a DFU restore fails due to water-damaged components on your iPhone. If you are certain you’re iPhone is free from any water damages, then you may proceed with the DFU update or restore. Here’s the standard process of putting your iPhone 6 Plus into DFU mode and how to perform a DFU restore. In this process, you will need a computer (Mac or Windows) preferably the ones running the latest version of operating system. Connect your iPhone to your computer. Your iPhone can either be turned on or off. On your computer, open iTunes. Using the latest iTunes version is recommended. Now press and hold the Sleep/Wake button and Home button of your iPhone simultaneously for 8 seconds. Once you see this message, let go of the Home button. If you have successfully entered DFU mode, your iPhone’s screen will become completely black. If it’s not, try again from the start. Start the DFU restore or update using iTunes. It could take longer for iTunes to download the software (depending on the file size) for your iPhone, so please wait until the download is complete. If something goes wrong in the process, like when the DFU restore could not be completed, then it’s possible that your iPhone is damaged. A damaged component can prevent the DFU restore from completing. If you’re iPhone is still stuck in recovery mode and that you already ran out of options to try on, then you better contact Apple Support or your phone carrier to escalate the issue for further support and recommendations. There’s a bigger possibility that your iPhone is physically damaged and that already requires technical service. We are here to help! If you need further assistance with other problems on your iPhone 6 Plus or other iDevice(s), feel free to fill up this form with all the required information. We would appreciate if you could provide us with more important details of the problem you have in order for us to be able to make more accurate analysis, and so we could come up with the best possible solutions and recommendations for you to try on. You can also view more solutions to other iPhone 6 Plus problems we’ve addressed in our previous posts through our Troubleshooting Page.